With so many stories, movies, plays, books, pictures, and any other possible visual representation of The Nativity scene its hard to know exactly what happened and how in regards to the birth of Jesus. But looking a scripture, we see a more clear and realistic picture of the birth of Jesus. Reading Matthew 1:18–25; 2:1–12; Luke 1:26–38; 2:1–20 we can see what God has allowed us to know about his birth. While Mary was pregnant with Jesus, Augustus Caesar issued a Rome wide census requiring all people under Roman control to register in their homeland dated around 1 to 3 AD. For Joseph, it was Bethlehem because he was in the family lineage of King David. This is actually prophecy in Micah 5:2, the exact small town the coming King of Israel was going to be born. Upon returning to Bethlehem; so did every single other person who had family lineage in Bethlehem's historic region. Thus, it was super busy and crowded. Every family member came from all over to stay in Bethlehem; there were no rooms left. Some people like to think of a nice warm Hotel Inn and Suites but this may not be the case. "Inn" in Luke 2:7 more accurately translated as "guest room". Given that this would be huge family gatherings and understanding the culture; it is more likely not a Hotel but host family houses. But because everyone came into town there were not enough rooms. So, they had to stay where the family kept all the horses and animals (the garage or backyard stables). Either way, there was no room for them where people were suppose to sleep. There is a very interesting idea about the location of Jesus' birth. Given the specifics of the prophecy and the different facilities in Bethlehem; in northern Bethlehem there is something called Migdol Eder. It was a watchtower that housed baby lambs who were kept safe so they could later be used for Passover and sacrificed. In Micah 4:8 he mentions this specifically. This can also explain why the shepherds knew exactly where to find the baby Jesus. The location is also very symbolic; under a watchtower where new born lambs were kept safe until they were sacrificed. Jesus, new born baby came to be sacrificed for the sins of the world. Regardless, the location and situation is a very humbling one for The King of the Universe to enter into the world in. Born where animals live. First the shepherds come to see baby Jesus around 1 to 3 AD. They saw him still in the manger. They worshiped and made a scene proclaiming what the angels told them about this baby.Mary then had to wait 40 days to complete her purification after giving birth. They then went to make the sacrifice for her purification according to Luke 2:22. Simon, at the temple, sees Jesus and knows who Jesus is and praises him. Anna the Prophetess is also aware of the greatness in their presence and beings to praise God. Keep in mind, Jesus is still under 2 years old. Then, 2 years later, the magi (The Wise men) come to worship toddler Jesus. The magi apparently are the only ones who see "His star" in the east and they would have known about Daniel 9 timeline till the Messiah comes. They are wise because they understand scripture and the prophecies of this coming king (Daniel, Micah, Isaiah and others). They are lead by The Holy Spirit and given understanding. Thus they travel to the capital of Jerusalem to find the new born king. They meet with Herod and ask about Jesus but Herod does not know. The chief priest and pharisees are asked about this and they 'know' of the prophecy. Herod then tries to trick the wise men into finding this future king for him so that he can later try and kill him. The Pharisees and chief priest tell the magi what town is prophesied so they head that way. The wise men see the star again and it leads them directly to where Jesus is. They entered "the house" where 2 year old Jesus is with Mary. The gifts they present are extremely symbolic and foretelling the life of Jesus. Gold, frankincense, and myrrh; Gold for his Kingship and Royalty. Frankincense is used in religious ceremonies; thus is for his High Priest role. Myrrh was used for embalming dead bodies; Jesus came to die for God's chosen. The magi then worshiped the 2 year old Jesus for an unspecified amount of time. They left back to the east and avoided King Herod. This made Herod upset. He ordered the murder of all first born boys ages 2 and under in Bethlehem and surrounding regions in an attempt to kill Jesus. Angels warned Joseph and had them move to Egypt. After Herod died around 4 to 5 AD, Joseph returned to Israel and moved to Galilee. But Herod's son was ruler and was just as paranoid. He knew what his father tried to do years before. So Joseph moved to Nazareth to avoid Herod's Son. This is where Jesus remained and grew up. 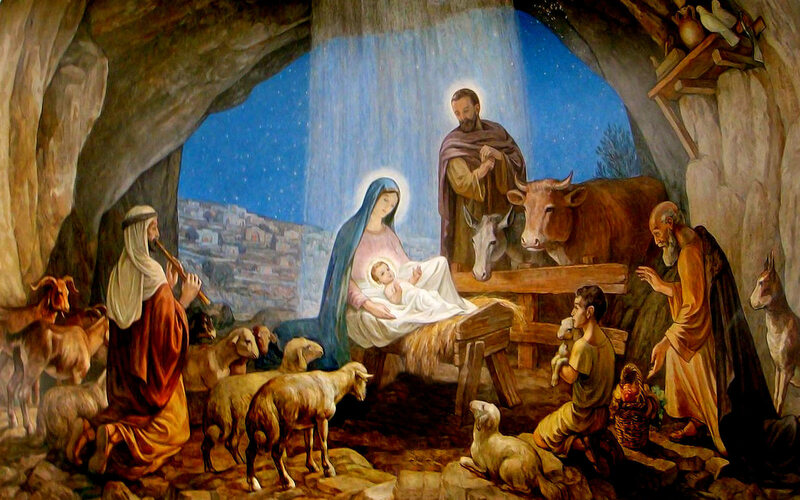 1-3 AD: Rome census required Joseph and pregnant Mary to go to Bethlehem. They had to stay in the stables of a host house or maybe even the Migdol Eder of northern Bethlehem where Mary gave birth. 1-3 AD, 1 month old: Shepherds visit Joseph, Mary, and baby Jesus. The Magi see The Star and begin their travels to Jerusalem from the east. 1-3 AD, 1-2 months old: Joseph, Mary, and baby Jesus go to the Temple and receive praises from Simon and Anna. 3-4 AD, 2 years old: The Magi make it to Jerusalem from the east and then to Bethlehem at a house and give their gifts to toddler Jesus. The magi leave and Herod orders the murder of all first born boys ages 2 and under. Joseph takes his family to Egypt. 4-5 AD, 3-4 years old: Herod dies and Joseph brings Mary and toddler Jesus to Galilee and then settle in Nazareth.